Who doesn’t love indulging in baked goods during the holiday season? Freedom Market vendors put lots of love into home-baked cookies each year, and our volunteers brave the cold to hand them out for FREE throughout Old Town Fort Collins. Our gracious market host, Bean Cycle Roasters, offers locally roasted coffee, and a regularly-changing array of artisanal coffee drinks to keep you warm and caffeinated while you shop. To celebrate the 10th anniversary of the market, we’re giving away an amazing gift basket, stuffed full of handmade goods from our vendors. You can’t win without visiting! From architectural drawings of local landmarks, to yarn made from the wool of Fort Collins sheep, to cards that finally let you truly express your love for bikes and beer, you’ll find amazing and unexpected gifts at the Freedom Market. The Freedom Market is a dying breed of craft market that doesn’t charge artists to participate. While we encourage you to support every artisan market in town this season, if you’re only going to shop one, this one is your can’t-miss opportunity to make a real difference in the Fort Collins artist community. The Freedom Market is a true artist collaboration, with participants doing everything from hanging posters and setting up tables to recruiting volunteers and baking cookies. The Freedom Market is Saturday, December 8, from 9am to 3pm at The Bean Cycle, 144 N. College Ave, Fort Collins. The 10th anniversary Fort Collins Freedom Market is almost here, and we have a great lineup of vendors for you this year. Come join us this Saturday, December 8 from 9am to 3pm at The Bean Cycle, 144 N. College Ave, Fort Collins. We are now taking applications for our 10th Annual Holiday Freedom Market! The Holiday Freedom Market is volunteer-run & free for makers and artists. That’s right, no booth fee! It is held every year at Bean Cycle Roasters in the heart of Old Town Fort Collins. We are looking for 15 makers and artists to participate. Please apply by clinking on link below! APPLICATIONS ARE CLOSED! Thank you so much to everyone who applied this year! We will notify makers of their acceptance by the end of the day on Friday, September 21st. Join us for the 9th Annual Holiday Freedom Market! Local Makers, free cookies, delicious locally roasted coffee from Bean Cycle Roasters, midmod home goods and accessories from Singularity ltd. and art from Half Crown Creative! Support local makers and businesses this holiday season! The Freedom Market is a volunteer-run market that’s free for the makers. All participating artists and crafters get to keep 100% of their profits! Shop local and handmade! 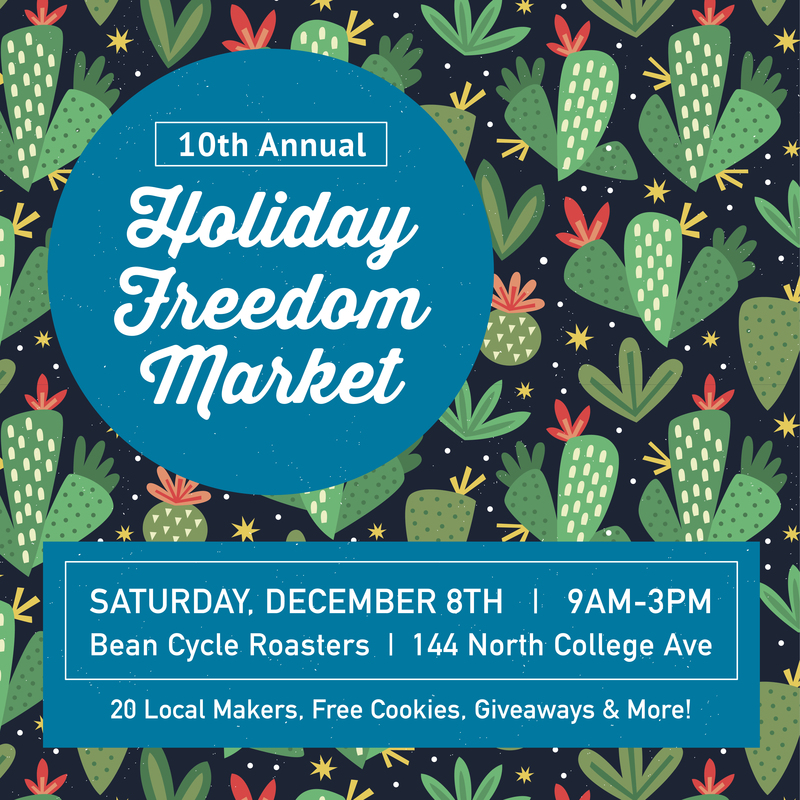 We are happy to announce our 9th Annual Holiday Freedom Market at the Bean Cycle Coffee Shop! This year’s market will be on Saturday, December 9th. Download the pdf below for more information on the event and application. Beldamia (pronounced bell-dame-ee-ah) is a made up word with witchy roots. Beldam or beldame is an old word for witch. To Beth Kopp, the maker behind Beldamia’s soy wax candles, it’s a place for magical things, a happy place, filled with candles, crystals, a tarot card or two, cats, herbs, flowers, good books, and friends. Beth’s gorgeously-packaged candles come in a variety of nature-inspired scents like White Fir, Rhubarb Fig, Lavender, and more. The Freedom Market will be the public’s first opportunity to sniff and purchase Beldamia candles in person, so don’t miss the opportunity! This year’s Freedom Market will be held on Saturday, December 10 at the Bean Cycle/Wolverine Farm Bookstore in Fort Collins, Colorado. The show runs from 9am until 3pm. Another great, local market is happening this Saturday at @wolverinefarm from 10-4! The first 40 people in the door will receive a free gift (from one of the vendors) and there will be an outdoor woodshop, festive popcorn and more! We hope to see you there! Today is the day! Come on down and shop small!! One more sleep and it’s market time!! And don’t forget—If you purchase anything from a vendor tomorrow, you’ll be entered to win a basket FULL of items donated by our makers to celebrate our 10 year anniversary! It’s seriously incredible, so come on down and see what it’s all about. (Side note: we just liked this photo, live flowers will not be included in the giveaway ).